What is the age range for getting the flu shot? The expert recommendation is that everyone who is age 6 months or more, through old age, get a flu vaccine each year. You should get an influenza vaccine as soon as you can, before flu season begins. Flu shot recommendations change over the years, so you may see some changes when you visit your doctor. The recommendations for the coming winter season are published in August of each year by the Centers for Disease Control and Prevention. Experts recommended that everyone who is at least six months old get a flu vaccine each year as soon as they can and before flu season begins. One change for 2015-16 is that there is no preference for live attenuated influenza vaccine over inactivated influenza vaccine when either is available. children who received at least two doses oft trivalent or quadrivalent flu vaccine before July 1, 2015 need only one dose for 2015-16 season. These doses do not have to have been given during the same or consecutive seasons. Recommendations continue to be clarified rules for children with egg allergies. It is okay to get a flu shot if your child can eat lightly cooked eggs or only gets hives after eating eggs, although he should be observed for 30 minutes after getting his flu shot in case he does have an allergic reaction. Flu Shots - When Should You Get It? In past years, because of the shortages and delays, you didn't have much choice over when you could get your kids vaccinated. Most parents simply tried to get their kids vaccinated whenever they could. 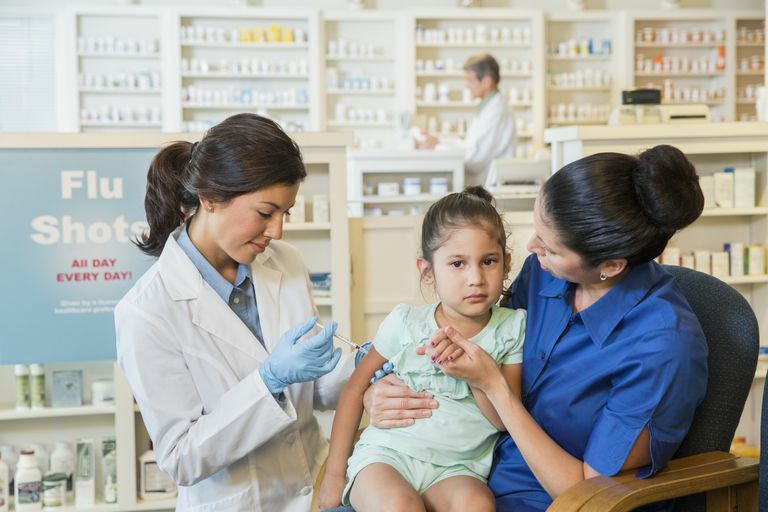 When there's a ready supply of flu vaccine, you'll want to get your child vaccinated before flu season starts or as early as possible during flu season. You could get your flu vaccine at any time, but the longer you wait, the greater the risk that your child will catch the flu before he is protected by his flu vaccine. Keep in mind that a typical flu season usually begins in December, peaks in February, and may continue until March. Pediatricians used to start giving flu vaccine, if they had it, by mid-October and would hopefully finish vaccinating the majority of their patients by December. The latest recommendations are that doctors start giving flu vaccine as soon as it is available. Flu Shots - Who Needs One? Remember, the latest recommendations are that everyone should get a flu vaccine. And with the latest flu shot recommendations, experts now advise flu vaccines for everyone, including healthy adults between the ages of 18 and 49, so basically everyone over the age of 6 months should get a flu vaccine each year. Healthy people who are 2 to 49 years of age and not pregnant -- including health-care workers (except those who care for severely immunocompromised patients in special care units and persons caring for children younger than 6 months) -- can be vaccinated with Flumist, the nasal spray flu vaccine. When Does Flu Season Typically Start and End?